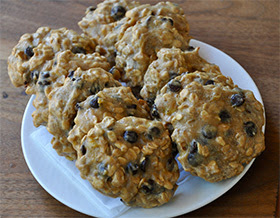 Easy Protein Cookies – Livermore ~ Pleasanton ~ Dublin Residents! Did you ever think I would post a recipe for cookies?! While it may seem crazy that your favorite fitness professional is sending you a cookie recipe, just wait until you see the ingredients! Let’s just say that there’s zero guilt in enjoying one of these wholesome chocolate chip cookies – preferably while it’s still warm out of the oven. The chocolate chips that I’ve used in the recipe below are sweetened with stevia – which is a natural, zero-calorie sweetener and can be found at your local health food market. By using these stevia-sweetened chocolate chips we are able to remove all of the refined sugar from the cookies, giving you a sweet morsel to enjoy while staying on track with your fitness goals. And with only 5 ingredients these delicious cookies are super easy to make. Enjoy! In a large mixing bowl, mash the bananas. Add the remaining ingredients and mix well. Form 12 golf ball sized cookies out of the dough and press onto the parchment paper. Bake for 10-12 minutes, until golden. Best enjoyed while still warm! Your Life, Your Body, Your Adventure…Train for It! Get The 7 At Home Workouts! Get instant access to workouts we designed to help our high-end clients get toned, tight and lean while at home or on the road. Guaranteed to melt fat and get you in shape in record time! Fun, energizing activities crafted to help you reach your fitness goals fast!